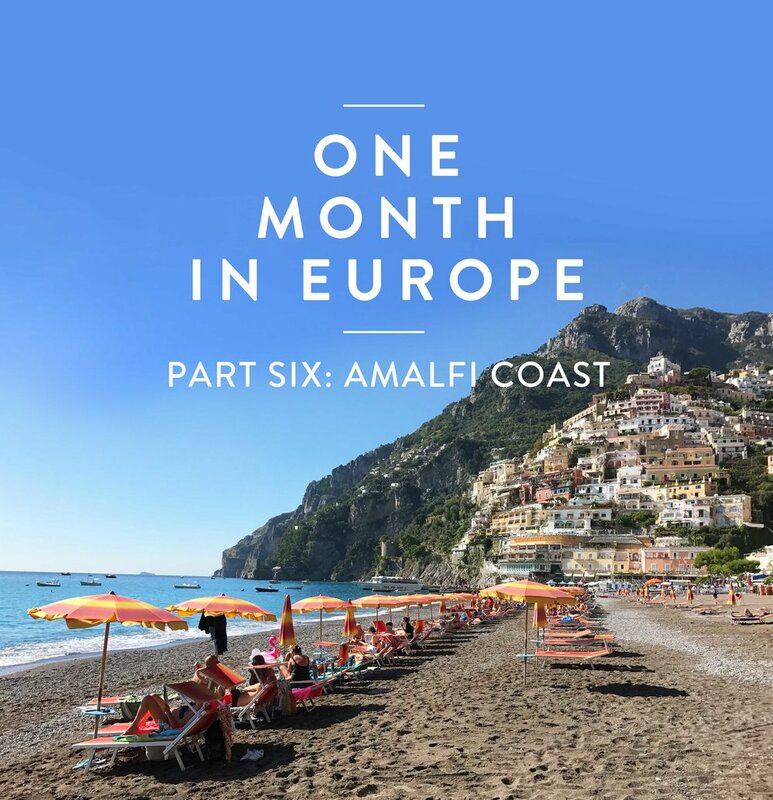 We departed from Rome and began making the journey to the Amalfi coast, which is not the easiest place to get to. From Rome, we took a train to Naples where we stayed in an Airbnb overnight before hopping on another train to Sorrento. Naples is not the safest place, in my opinion. Perhaps it was the neighborhood, but it was definitely sketchy and luckily we were in safe hands at our Airbnb hosts, who picked us up from the train and also drove us to the Sorrento train in the morning. We barely stepped foot on Naples ground. From Sorrento, we took a bus to the Amalfi coast - something we booked last minute (yes - this is the part of the trip we were winging). Gah. A bit exhausting, and if I were to do it again I’d just cough up the $ for a private car to drive us, at least part of the way, and not deal with the logistics of it all. When we arrived we nestled into our cozy Airbnb, which was high up on a hill in Praiano. Praiano is nice, but it lacks the energy that Positano has, so I would highly recommend staying in Positano because it’s just an easier central base to get around. We found ourselves taking the bus to and from Positano almost every day, and it wasn’t the most convenient thing in the world. However, we did find some gems in Praiano, particularly the restaurant Costa Diva that was absolutely stunning and the food was amazing. Just for that experience alone I don’t fully regret our location! In Positano we mostly strolled leisurely, stopping in at local places to eat. We also spent time at the beach, kicking back and enjoying some champagne as a newly married couple should. I also learned that there are three main beaches in Positano, but the main beach, the Marina Grand Beach, (the one with the orange umbrellas) is the best, most glamorous and busiest. Unless you are looking for something super laid back, that’s where you want to be. It’s also surrounded by restaurants, shops, and it’s full of great people watching. As part of our honeymoon, we decided to book a fancy dinner. 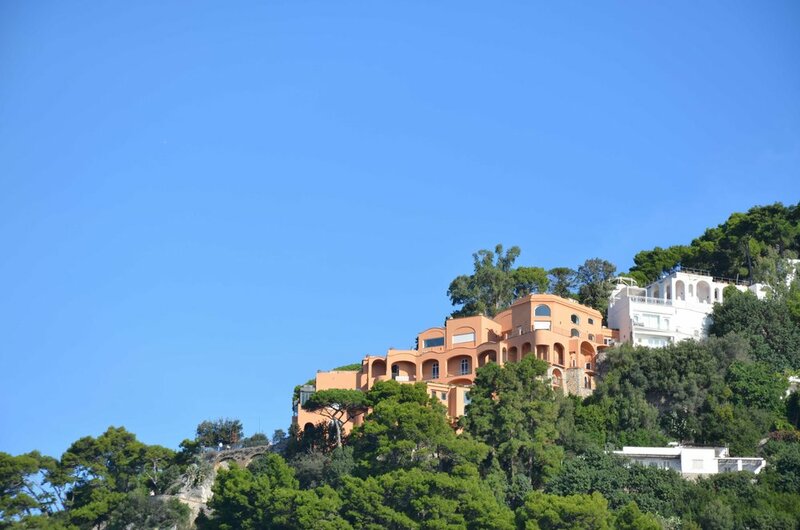 We arrived at the Champagne and Oyster bar at Le Sirenuse Hotel for some relaxing and indulging before heading up to our dinner reservations at La Sponda inside the hotel. Good news and bad news here: The hotel itself is charming and magnificent in every way possible, it’s an absolute dream. I highly recommend (if it’s in your budget) to sip on champagne and eat some oysters at the Champagne and Oyster bar if nothing else. It overlooks the beauty of Positano and it’s just so chill and enamoring. The bad news: This place is pricey. We did it to ourselves, we realized, when we decided to do the tasting menu at La Sponda. And while the atmosphere is stunning and the service is superior, the food didn’t quite live up to expectations. My recommendation if you go would to just be to get an entrée, skip the tasting menu, and be there for the luxury of the surroundings. It’s incredibly romantic. Another gem we stumbled upon in Positano was Casa E Bottega for a super fresh and delicious lunch. This place hit the spot so much that we went here twice, and I’ve been dreaming of it ever since. The food is healthy, interesting, and just plain good. The interior is also beautiful yet casual - and acts as a partial home decor store, so you might pick up something for yourself after lunch. The only downside here is that they only have inside seating, but who cares? It was just as nice. On another one of our days spent in the Amalfi coast, we took a day trip to Capri island and stopped in at the blue grotto along the way. 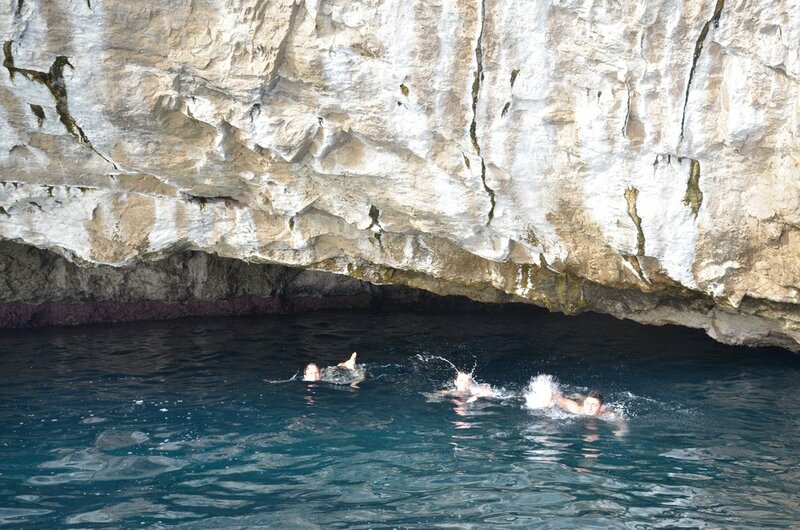 The blue grotto isn’t always accessible, since it depends on the tide - but we were lucky enough to be the last crew of folks that they let in before it was a no go for later arriving tourists. Basically how it works is they put two people in teeny tiny little row boats with a man who rows you through (ducking all the while) a very tiny entrance into the grotto, where you spend under 5 minutes witnessing the beauty of the ultra bright blue water. I believe it costs around 10 euro, but I can’t remember. During our 5 minute adventure, Chris sparked his inner adventurous spirit and asked if he could jump in! I of course stayed put, and snapped some pics of his silhouette swimming in the deep blue, wondering when he would get back into the tiny boat safely. We exited as the last tourists, and the guide charged Chris 50 euro for his dip. Scammed, I tell you! Worth it? Still not really sure, but Chris would say yes. 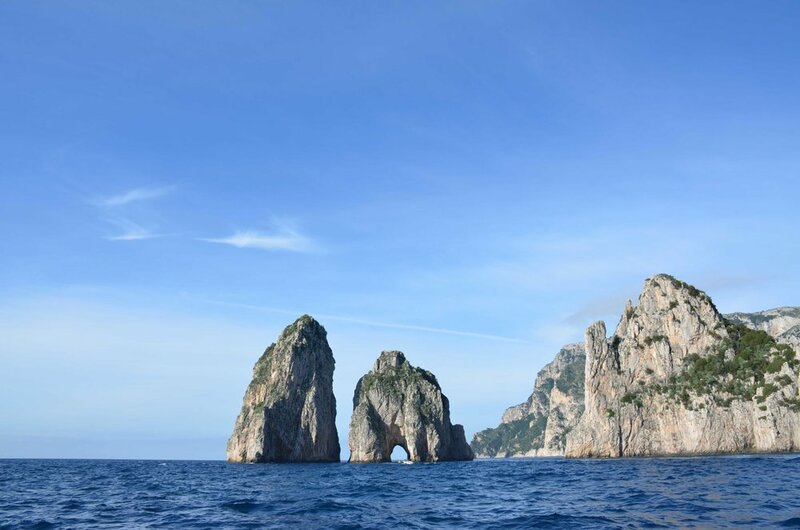 Capri island, to me, wasn’t super eventful. Granted, we didn’t do much research prior to arriving, but it just seemed like another place to walk around, check out tourist shops, and have lunch. There was really nothing particularly interesting about the island to me. 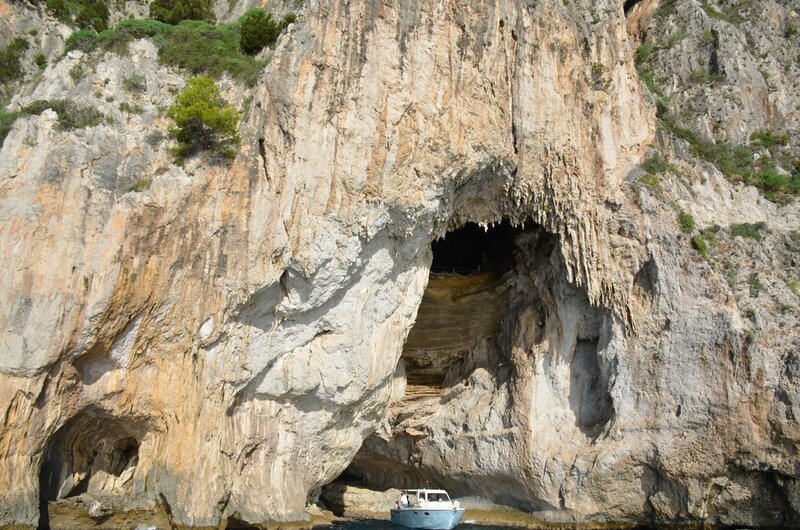 What was more beneficial about the trip was the boat ride in and eyeing the rock formations on the way, checking out the surroundings of the island, and actually exploring some of the nooks and crevices of the rock formations along the shore. Note that we did zero research, so there might be something worthwhile that I’m not aware of! Overall Amalfi was a great place to relax, take in some sunshine, and get away from big cities. We enjoyed the downtime but were even more excited for our final destination - Greece!